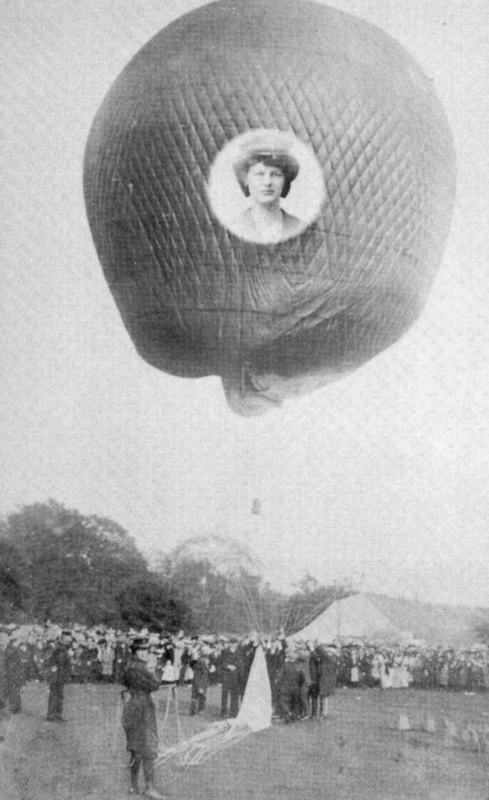 Dolly Shepherd sat down on a bench holding the silken Union Jack Handkerchief that she would use to wave at the crowds as she made her ascent under the balloon. Dolly Shepherd with a Balloon waiting to take off. Some of the art created about Dolly Shepherd from Herts Hidden Heroines Workshops with Year 5, St. Peter School Rickmansworth. Edwardian parachutist, trapeze artist, hot air balloon jumper. Dolly Shepherd was born in Potters Bar, Hertfordshire, as Elizabeth Shepherd. At the age of 16, she overheard two men discussing the loss of a target for an act in which they shot an apple off a girl’s head; she volunteered on the spot. 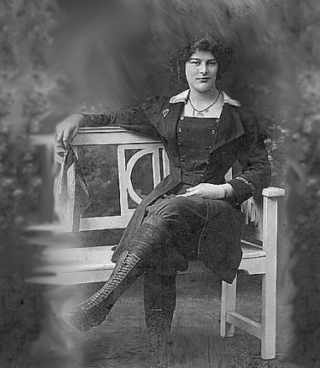 In 1905 she ascended on a trapeze slung below a hot-air balloon to a height of two to four-thousand feet before descending on a parachute. On one occasion both the balloon and the parachute malfunctioned, and she found herself rising to 15,000 feet. At this height, both the cold and lack of oxygen were threatening to make her lose her grip and fall to her death. Fortunately, the balloon returned to earth before it was too late. She was not so lucky on a later occasion when she ascended with another girl. The other girl’s parachute would not release, so she had to wrap her arms and legs around Dolly so that they could descend on the one parachute. The descent was of course much too fast, and Dolly was paralysed for several weeks. She nevertheless returned to her act. Dolly managed a flight with the Red Devils display team a few years before she died at the age of 96 and they even did a fly by at her funeral in tribute to her. This page was added on 14/12/2016.